6.17 points at 6 votes (rank 595). 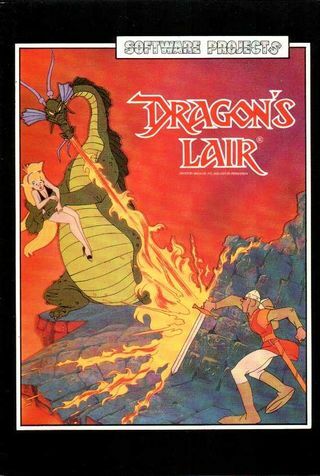 Dragon’s Lair is supposed to be a kind of animated cartoon in which you steer the character yourself. 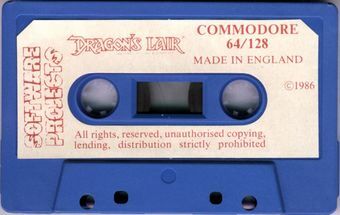 On some systems, especially in the arcade original and later on the SEGA Mega CD, this was realised without compromises, in contrast to the versions for the C64 and other 8-bit computers. Here you are of course far away from a real animated movie. In return these conversions offer a bit more freedom of movement. This game is a high-fantasy adventure. The player steers the knight Dirk, who wants to free the beautiful princess Daphne from the clutches of the dragon Singe. ...there was a peaceful kingdom with a good and wise ruler named Aethelred. This king was immeasurably rich and his treasure chambers were filled to the rim. But none of these treasures were as valuable as his only child, his daughter, Princess Daphne. Many princes, heroes and noblemen came from far away and wanted to ask for the beautiful princess' hand in marriage. They did not sense how futile their undertaking was, because Daphne was already in love with someone else. 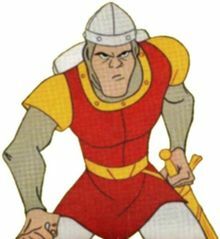 It was a knight of the king's court, named Dirk the Brave. He was the best knight in the kingdom and favoured by the king. Dirk also feels the same for Daphne and so far everything seems to be good. But the peace did not last forever. One day, a mighty and evil dragon appeared in the kingdom of Aethelred. He wanted to enslave the people and demanded unconditional surrender from the king. When Aethelred refused to do so, the dragon, named Singe, kidnapped the princess Daphne without further ado. As every dragon, he enjoyed the look of a young, beautiful human lady. He locked Daphne into a huge crystal ball and held her captive in the dungeon of his fort. At the same time he issued an ultimatum to the king: "Disclaim your kingdom before the sun goes down or your daughter will die....."
Not only king Aethelred, but also every inhabitant of the kingdom, from vassal to noblemen, were desperate. The princess was very popular amongst the people. Only Dirk, who did not know such things as fear, kept a clear head. He decided to rescue Daphne or die while trying. 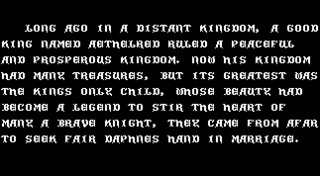 The plot is a really stereotype fantasy classic: heroic knight defeats dragon and rescues the princess from the enchanted castle. What more do you want? 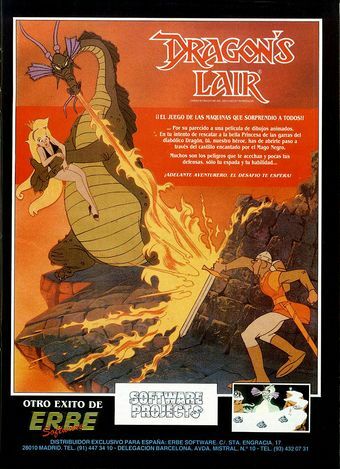 The computer game Dragon's Lair was already released in 1983 as arcade machine. 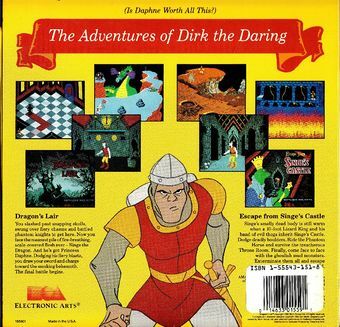 The player steers knight Dirk through the interactive cartoon. 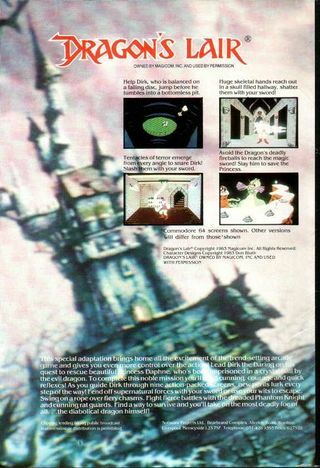 The whole game consisted of movie sequences that were played from laser disk. The player had to make a certain joystick movement at a certain time to make to story go on. A wrong input led to one of the numerous death sequences. With this technique it was also possible in this game to release versions for laserdisk devices at and later for the DVD players. You then simply steered with the remote control. The graphician was Don Bluth, who worked mainly for Walt Disney at that time. Later he also released an own title, the movie An American Tail. 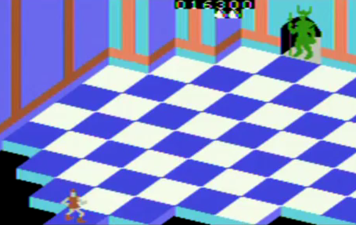 Of course, no films are played on the C64, the game consists as usual of background graphics and sprites. For obvious reasons, Dirk has by this much more freedom of movement and can be steered normally. The conversion for the C64 was published in 1986. 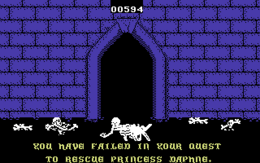 The C64 version of Dragon's Lair has 8 levels. Level 1: Skull Hallway: Go slowly to the rim of the ridge. Then jump. In the middle of the round platform you better place Dirk as centrally as possible. When the cloud demon appears then lickety-split run against the wind's direction. It is also helpful to swerve a bit. Level 2: Burning Ropes: In good old Tarzan tradition you swing from rope to rope here. Precise jumping is not a matter of luck but a question of the right timing. For it not to get too boring, Dirk gets a fire under his rear end. Level 3: Weapons Room: Here all kind of stuff hovers and swirrs around. Also the old knight's armour and several weapons awake. The only thing that helps here is to swerve and defend yourself. Level 4: Giddy Goons: Many paths and many dangers. Fast reaction with sword blows and evasive jumps are required. Level 5: Tentacle Room: You only have a short guest performance here. It is called Tentacle Room, but what comes through floor and ceiling looks more like snakes. First avoid it and if this does not help any more, defend yourself with the sword! And then leave the chamber as quickly as possible. Level 6: The Ramps: The single platforms that form the stones unfortunately disappear after entering and leaving them again. So the way back is blocked - but this is no option for Dirk anyway. He can dispose of the annoying goblins or whatever that should be with his sword. Apart from that you need to jump on target. Level 7: Phantom Knight: After a second journey on a falling platform where you, as usual, should be blown down, you enter a kind of simple party of chess. This time you should not forget to jump off the disk at the right time. The phantom knight colours some field in red, which can get very nasty for the hero Dirk. After sufficient and successful jumping around and evasive actions you should soon get close enough to him to bean him. Level 8: The Dragon: Patiently avoid Singe's fire breath and hide behind the rocks as long as they are still there. 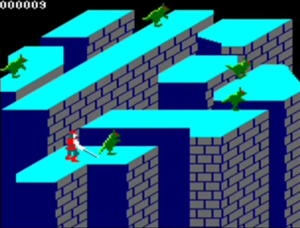 Then, at the right moment, quickly run to the magical sword, grab the thing and hop over the ramp onto the dragon. For the next move you do not need to be a genius: The scaled animal will be killed with the magic blade. 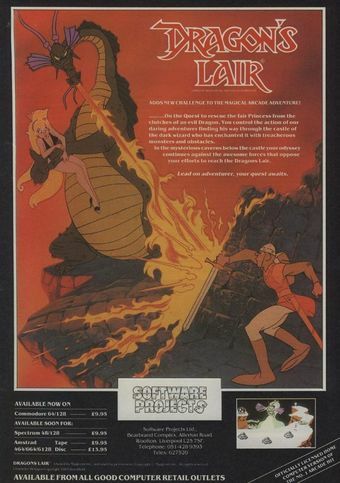 Then and as conclusion, you can add the title "Dragonslayer" and free the blonde maid from its vitreous cage. The calming white-blue pagefox starting screen greets me. No, I am really not in the mood for word processing today. I could also tinker with the hardware again. But this has time. So I grabbed the disk box and rummage in it. 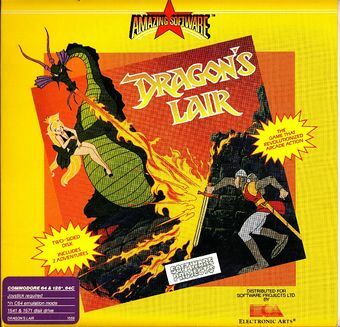 Summer Games, Pitstop, Pacman – oh my god, this is all such a long time ago – Dallas Quest, Dragon's Lair – Dragon's Lair? What is that and how did it get into my disk coffin? Having gotten curious I push the disk into the slot. Nice title graphics, I like that. Should put this down as Pagefox image - later. 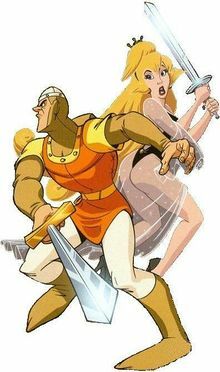 Aha, so I am the fearless knight Dirk and I am supposed to save Princess Daphne from the claws if the evil dragon Singe. I find myself at the rim of a shaft and I am standing on a wobbly board that slowly gives away under my weight. In front of me hovers a platform which does not inspire much confidence but is the only way to get away from here. So I courageously jump onto the platform when it instantly moves downwards in an incredible pace. Hopefully this will end well. First I place myself in the middle of the platform. I feel significantly safer here. Suddenly, a cloud appears from which a horrible wind gust emerges and grabs me. Only with lots of effort I can manage to run against the wind. However, there is no time to rest because the next wind ghost tries to blow me from the platform. This time, however, I am warned and react faster. Altogether there are seven wind ghosts trying to help me to get a free flight, then finally the platform comes to a halt. I hastily jump on a board that protrudes from the wall of the shaft. Good thing that I hurried with that, because instantly the platform goes further down and smashes at the bottom of the shaft. Carefully, I feel my way along the board and reach a corridor. Nothing happens. Is maybe the computer...? There! From the sides pale, theeth-clattering skulls approach me. A quick jump further down into the corridor take me out of the danger zone for now. Now a huge bone claw grabs for me from the right, which I smash with a well-aimed blow with the sword. Again, the skulls attack and again a jump further into the corridor rescues me. The bone claws want to squash me another two times, which I foil with my sword. From a side entrance doves (!) now emerge, the symbol of peace. Peace offers? Already? I do not fall for such a blunt trick. I jump forwards again and - the little blighters follow me. One step to the right and they give up the chase. They are probably scared of the jellyfish that slimily glide towards me from the right. Yuck! A fat step to the left, but the slime bags follow me. So I go further into the corridor. Still not outdistanced them. I flee now to the right into a side path from where a bone claw came earlier. I am surrounded by parching heat. It is clear that the jellyfish has not survived. In front of me is a room whose floor is covered with burning oil. Some platforms protrude from the sea of flames and so I jump from platform to platform. It goes on over ropes, that kindly hang down from the ceiling. So I swing over two ropes (always swing to and fro twice, this gives you enough swerve) to a small lift that gets me one floor higher where I get to the next lift over three platforms and two ropes. Again you get another floor higher. Jumping off the lift, I brachiate over three ropes to the rescuing exit while the whole room behind me is consumed by the fire. A weaponry room awaits me with pleasant cool temperature. A refreshment for my sunburns. The chamber is lit by a fire in a fire bowl. Maybe I can equip myself with some weaponry here. Nada! Instead, an invisibile hand throws an iron ball studded with thorns on a chain after me. A horrible weapon that I fend off with the sword. Now it tries to hit me with a jug but I swerve to the left and now stand before a statue with a threatingly upraised, double-edged axe. Suddenly, the statue comes to life and glides hugely an mightily towards me. I try to blow out its lights with the sword. Success! The statue disappear as if it never existed. Only the pedestal is left and... the axe that instantly attacks me. I just can jump to the right, where the ghost hand throws a shield after me. I jump to the right once more and stand in front of a second statue which resembles the first one to a dot. I also eliminate this one with the sword and flee from the axe to the left. Again, a shield is thrown after me, which I deflect with the sword this time. This shield must have accidentially triggered a mechanism, because now a door appears in the rear right corner. There is not much time for me to get excited about this, because now the axe that was attached to the wall takes off on its own and speeds towards me. With incredible presence of mind I jump deeper into the chamber where the fire now frees itself from the bowl and plans to burn my head. So I use the secret door and stand outside. Surprised, I look around. I am standing on a high wall, of which there are several ones here. Between them is a deep abyss. The walls make a solid impression, so I decide to have a breather. But don't be fooled. After a short time the wall dissolves. I flail my arms looking for help - but too late. So speed is of essence. At the next try I am more clever. Only now I notice the small green goblins that scurry to and fro on the walls. Just don't touch them. So I walk to the first abyss and strike out for the first sweeping blow. The first goblin is eliminated. Now I jump quickly to the second piece of wall and get going. The next goblin crosses my way. I kill him cold-blooded. After another jump over an abyss I neutralize no. 3. By the way, these walls are jumped with the SPACE key. With this system, poking after the goblins sometimes before and sometimes after the jump, I finally also get over the walls. Again, I am standing in a small room the resembles a weaponry. Tensed, I wait for items flying around. Nothing. However, this time the exit can be seen from the start and it is open. I just want to go on looking at the room when a huge snake curls down from the ceiling. I cannot deny anything to such a nice animal - except life, so I cut its head off. Now a snake emerges from the ground to the right of me. 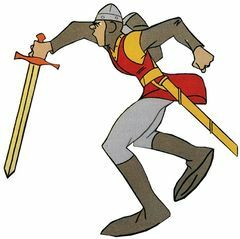 As I just clean my sword I decide to swerve to the left. From there, also a reptile wants to do me in, which I know to avoid with a huge jump into the room. I decapitate two snakes each from the left and right with a powerful blow. Somehow headless, the scaly bodies retreat. As I am pestered again by a snake from the right, I escape through the door and land on a wobbly board that slowly gives away under my weight. Wait a second, I know this one! I jump onto the platform and - yes! - it goes downwards at an incredible pace. The wind ghosts, nine of them, do not blow that hard this time, but for this longer. No problem for me. The platform comes to a halt. I leave it and enter a chamber with a floor of squared boards which is only held by two walls that are positioned rectangularly to each other. Some of these boards are obviously crumbled away and have crashed into the abyss below. The rest, however, is remarkably stable. On the opposite side is a gate secured by a grating. I jump a bit to and fro and suddenly, as conjured up, a black knight appears. He does not instantly attack me and he does not move, but coming from his position, some boards get red and this way, red stripes wander through the room. When I am standing on a red board or the board I am currently standing on does get red, this has utterly unpleasant consequences for me - I will then lose one of my valuable five lives. After a short time, the ghost knight disappears as suddenly as he had appeared and the boards take on their original colour. Now I can enter them again without peril. From time to time, the knight appears again and the same game starts anew. I can teach him some lessons and then I have to avoid the coloured fields again. When the knight appears, he gleams greenish for a short time. The more often I crown him with the sword, the longer he keeps his greenish colour. He probably gets green out of annoyance about not being able to simply flatten me with his red fields as he imagined. Finally, I get him in one of his green phases and he draws his last ghostly breath. Done. Also now the grating that closes the gate lifts itself. I pass the gate while hopping and instantly face Singe. With a quick look I take a sounding of the local situation. I am standing on a drawn-out rock projection, where some boulders are lying around. To the left of the rock projection the huge, massive shape of Singe lures, who guards Daphne who is captured within a crystal ball. My God, she is so beautitul... Pull yourself together, Dirk, I tell myself and at the uttermost end of the rock I see a sword that glitters at me happily. To the right of the rock lures an abyss, whose depth I cannot judge. Now, Singe has seen me and breathes fire after me. He aims damn well, so for now I look for shelter behind a lump of rock. To my horror I discover, that Singe's hot breath has melted away a part of the boulder and I can figure out for how long it is going to protect me. So I use a fire pause and sprint behind the next boulder. Whew! That was close. Nevertheless, I have the feeling that Singe has scorched my rear. Never mind! Quickly to the next rock. Full cover. Ha, again no hit! And now? Nothing in sight which could give me protection from the fire. Under one of the boulders, there is a heap of gold that I pocket along the way. On the way to the sword there is another obstacle, a kind of thorn bush. My tries to get around it fail. Damn, there must be a way to get around it! Does it?!? Why should not Singe remove the stuff for me? A try cannot hurt, I tell myself, and I place myself close to the bush, as far away from Singe as possible. He reacts superbly and sends me another hot love message. I quickly retreat from the bush and watch it burning under the burst. There! Now the path is free. I wait for another fire pause and run like hell. Finally I hold the magical sword in my hands. Despite its length it is light as a feather and lies in my hand like a pencil. There is a golden platform at the rock projection behind Singe. I use it as a jump board and the sword in my hand suddenly has a life of its own. Finally I execute the damn dragon. Singe, now residing in the happy hunting grounds, serves me as a bridge to my Daphne. I free her from the crystal ball and our hearts take fire. The hall of fame greets me rather soberly. I enter my initials - that's it. Lost in thought I watch my screen, cross the hands behind the head and lean back contentedly. Anguished, I flinch and instantly sit upright again. The version available on Gamebase64 was equipped by the cracker Wanderer (WDR) with a trainer menu. You can choose altogether 36 different functions to make Dirk's otherwise short life a bit more easier. 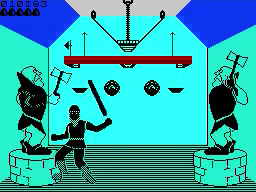 Heinrich Lenhardt in the Happy Computer 10/1986: "Of course the graphics cannot compete with the original, but the tested C64 version does not even use the computer abilities properly. Especially, the animation is is sometimes a very rugged thing. The motivation for the game was coddled up by the mental atrocoties of the programmers - if you lose all five lives you need to restart at the first level. 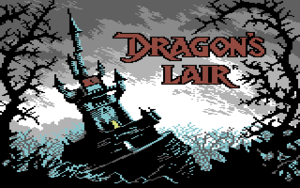 Dragon's Lair is actually only a slightly frustrating sequence of simple skill games. You have to mention positively, that concerning the gameplay there is more to be done than with the arcade machine original. Without the super graphics the game seems a bit poor and is at best suited for people who like it especially difficult." 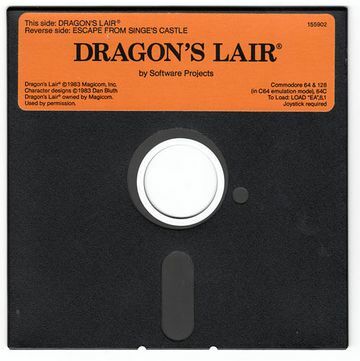 Manfred Kleimann in the ASM 8/1986: "Conclusion of the 'Dragon Slayer': I have had a lot of fun, although at the start I never made the right jump from the ramp to the disk (Tip: Try the space key to jump!). However, the graphics have wowed me. The characters are magnificent; the movements realistic, the background colourful! 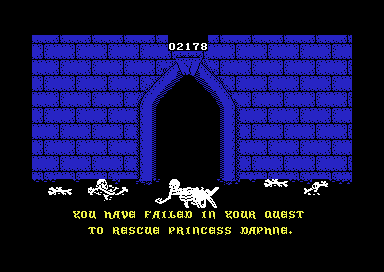 The sound on the other hand was a bit unnerving (especially when you lose one of the five lives. Then it lasts almost an eternity until you return to the game and the sound has therefore an enormously long "play time"...). The game idea which, as is known, comes from the "game hall" was actually well converted to the home computers in the shape of excitement and fun! There is not much to say about the motivation to play: For me it is a game that will soon be a classic. And "classics" are usually games that you load into the computer more than twice. The manual is in German; it is logical and cleary built up. Short: a good help for handling this complex action cartoon! 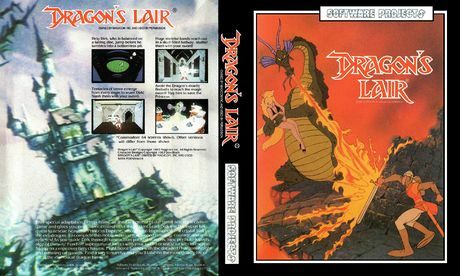 Dragon's Lair will become an 'Evergreen'!" Shmendric: "Ouch, I would love to know if the editor of the ASM really played this trash or simply made his evaluation up out of thin air. The graphics are horrible. I cannot say it differently, I think the game is abominably designed if you prescind from the title screen and the final with the dragon. Of course, I do not compare with the arcade machine version, but measure it by the C64 standard from 1986. There was more possible in every respect and especially it was possible to be done more beautifully! The sound categorizes for me as nothing special and in some situations degenerates to me into torture for the ears. Undoubtedly, the dying sequence is really much too long. The jump from the platform to the disk is, however, the easiest thing in the game. Everything after that gives one much more grey hairs." This page was last modified on 18 December 2017, at 15:57.